That is basically the short summation of the fact finding mission to Gaza led by Desmond Tutu. Perhaps, after words like that from a wise and respected man someone out there will listen…. we can only hope. A BBC report of Tutu’s visit is below…. Nobel peace laureate Desmond Tutu has called Israel’s blockade of the Gaza Strip an “abomination”. He strongly condemned what he called international “silence and complicity” on the blockade, which he compared to the actions of Burma’s leaders. Speaking at the end of a two day mission to the area, the former archbishop said the humanitarian situation there could not be justified. Earlier, 60 Palestinians were detained in an Israeli raid on northern Gaza. Residents in the Beit Hanoun area were summoned to a local square by Israeli troops with loudhailers before dozens were taken away, witnesses said. Mr Tutu was in Gaza on a United Nations fact-finding mission into the killing of 19 Palestinians by Israeli shellfire in November 2006. The former archbishop of Cape Town said the international community’s “silence and complicity, especially on the situation in Gaza, shames us all”. 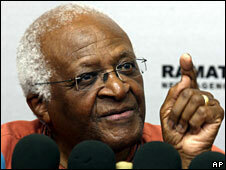 Mr Tutu said conflicts were resolved through talking to enemies not friends. He said his meeting with the deposed prime minister, Ismail Haniya, was an opportunity to tell the Hamas leader the firing of rockets into Israel was also a violation of human rights. During his two-day visit, Mr Tutu met relatives of 19 civilians killed in the Israeli shelling of two houses in Beit Hanoun and is due to report his findings to the UN Human Rights Council in Geneva. He condemned the incident as a “massacre”. Israel says the Beit Hanoun deaths in November 2006 were a mistake during action to target areas used by Palestinian militants. The Israeli military confirmed its pre-dawn incursion into Gaza on Thursday and said about 60 “wanted Palestinians” were being interrogated. Armoured military bulldozers destroyed farmland during the incursion, witnesses told AFP news agency. Israeli forces launch frequent attacks into Gaza which they say are aimed at combating Palestinian militants who fire rockets into Israel. Also, while Tutu is there, I’d like him to try to convince the “Israelis” to let the Palestinians Fulbright grantees from Gaza to be able to leave for their schools in the U.S. Since it appears the U.S. department of State doesn’t have any kind of influence on the “Israeli” government!… ridiculous! The State Department seems to be colluding with the “Israeli” government to besiege the Palestinian students in Gaza. If only there were more courageous, decent, moral people like Desmond Tutu on the planet. More power to him.